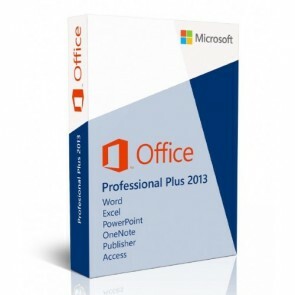 Microsoft Office Professional Plus 2013 is compatible with Windows 7 or later, enables you to work together even better by giving you more control over compliance, new tools for analyzing and sharing data, and more possibilities for communication. Plus Microsoft Office Home and Business 2013 License, Access, Skype for Business, and InfoPath are included in the suite. Home & Student: This retail suite includes the core applications Word 2013, Excel 2013, PowerPoint 2013, and OneNote 2013. Home & Business: This retail suite includes the core applications Word 2013, Excel 2013, PowerPoint 2013, and OneNote 2013 plus Outlook 2013. Standard: This suite, only available through volume licensing channels, includes the core applications Word 2013, Excel 2013, PowerPoint 2013, and OneNote 2013 plus Outlook 2013 and Publisher 2013. Professional: This retail suite includes the core applications Word 2013, Excel 2013, PowerPoint 2013, and OneNote 2013 plus Outlook 2013, Publisher 2013 and Access 2013. Professional Plus: This suite, only available through volume licensing channels, includes the core applications Word 2013, Excel 2013, PowerPoint 2013, and OneNote 2013 plus Outlook 2013, Publisher 2013, Access 2013, InfoPath 2013 and Lync 2013.